Apologies for all these questions, is it possible to have a decimal point in these fields, without manually inputting one as you type? You can have the output converted to have decimal places by using Calculation. 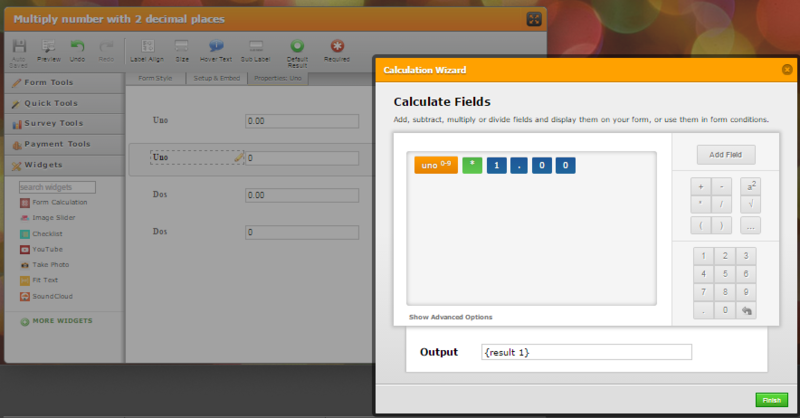 Example, you can multiply the input value by 1.00 and it will have 2 decimal places as a result. You can just hide the original input and show the with decimal output to make it more precise. OR just hide the with the decimal output and just show only the total result as the one that have decimal values. Hi, perhaps I didn’t make my original question clear; I want the field circled in GREEN to display numbers with the decimal point, as you type. 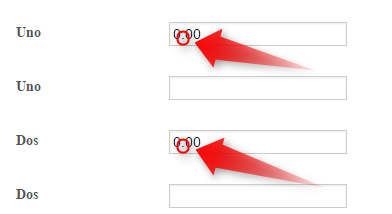 In effect I would like the field to display numbers in the same way the field you have circled in red. If you look at my colleague's example it already has a decimal placed into it. You said that's incorrect so did you maybe mean that you wanted the decimal to be placed automatically when numbers are entered into that field then? Is that what you meant instead? You could use a mask input on the textbox. However, you'd still need to specify where you want it. Other that my colleagues's workarounds to have decimals on the text boxes fields, I think that there is no other way to accomplish this with the current features. If you want to, we could raise a ticket request to our second level to have this option available, if approved, we could not provide you an estimated time for the implementation. Let us know if you would like us to request this. Please if you can raise a ticket, I’d really like to make this form available asap. The ticket request has been raised to our Dev team, you will be updated in this thread. Unfortunately there is no updated response yet from our dev team. I also would like to inform you that this feature request is not among on the high priority lists. So, it may take some time before our development can really attend to this. and what do I do with the code? When using the form's full source code, you can add custom script that can influence the output or format of input data. Please refer to this article for the idea. Here is the demo from that article. 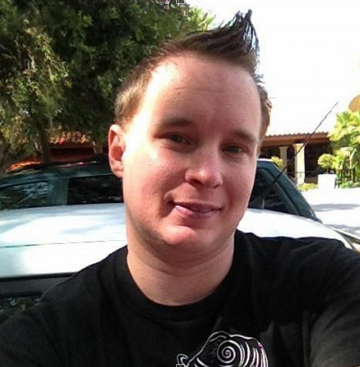 Is there a way for you to embed the form using its full source code? You will need to host it on your own website. So, the main requirement is also to have a website where you can embed the form using its full code. Hope I was able to explain it more clearly this time. Inform us if you need further assistance. Thanks, but a little too complicated for a non techie like me. It seems that you will have to wait for an update with our developers or technical team regarding this matter. I believe my colleagues have presented a number of workarounds. And it seems that editing the source code is not an option, but if you have decided to try it, we'll be glad to help you in every step of the way. The mobile response widget has a bug which is awaiting a fix, the workarounds your colleagues have suggested are only half measures and do not fully solve the issue. I understand and I do apologize for the inconveniences that this might have caused you. This has been already escalated to our developers, rest assure that they are aware of this matter. You will receive an update when they found a solution.